What is in your mind if you see two men who are big men (almost defeating an elephant) are wrestling while shirtless in a ring / stage while watching many people? Next they will drop each other until there is only one person left. Funny? Maybe if in Indonesia, we would consider this a slapstick joke, but it would be another matter if this game was done in Japan. Sumo is the only sport that uses the pastor as the match referee. Besides that there are various meanings and symbols in it. The wrestler who fights is likened to a human who will communicate with Us or a god. Enter into a temple or sacred place which is symbolized by a sumo arena ring. Furthermore, the two fighters will perform other rituals, such as throwing salt into the arena as purification and clapping their hands repeatedly as a marker for our existence for them in addition to driving out the evil spirits that surround him. Being a Sumo referee was not easy in a past belief. If a referee makes a mistake in making a decision, the sentence is to commit Seppuku in the Japanese Samuari tradition. Where Seppuku is a ritual of suicide for an army that breaks the rules or fails to carry out a mission. Living as a professional wrestler means that you have to be willing to live a different life from others. The advice of parents, "do not sleep after eating" becomes a taboo for them. After eating a special food commonly called Chankonabe which is a soup that contains various types of protein and vegetables that are put together by a broth, they have to sleep to keep their body filled and have the right weight. One of the things that we may not know is how these wrestlers do the exercises, which are heavy and tight. Many Japanese youth are no longer interested in doing it. Ironically, the big names of wrestlers today are even held by people from outside Japan, mostly from Mongolia. 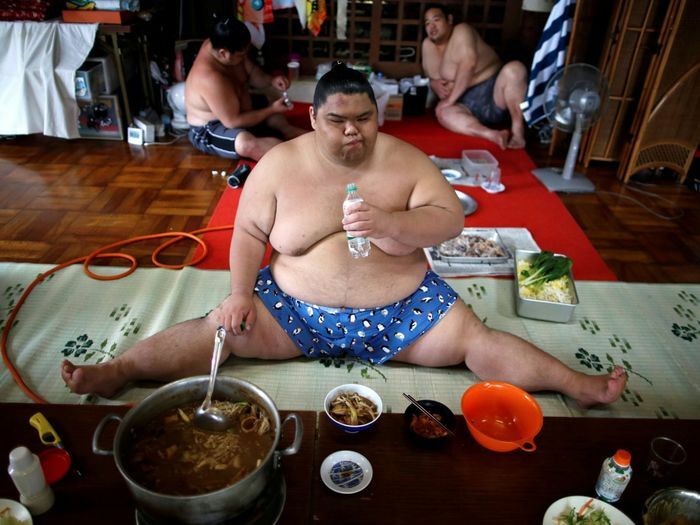 To get such a large body, the wrestlers are forced to eat 8,000 calories a day. 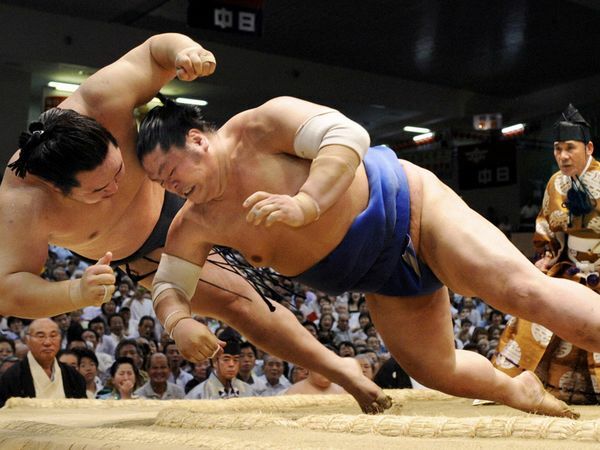 Similar to some other sports, which emphasizes competition between men, but in sumo sports it is even more cruel. Where women are not only prohibited from participating in sumo sports, even women are forbidden to enter the ring because they are considered to 'pollute' the purity of the ring. There was even a stir when the Osaka female governor in 2000-2008 entered the ring to present prizes to the winners. Ironically, in recent years this traditional sport has increasingly received negative attention from its people. Sumo's popularity level dropped dramatically as the number of television viewers for the annual sumo festival continued to decrease.